According to an article by Mauro Spinelli (CSIL) issued in the World Furniture magazine #70/September 2016, the office furniture market in Europe recorded a positive growth for the second year in a row (+4.7% in 2015). 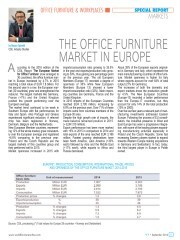 The CSIL report “The European Market for Office Furniture” (June 2016 edition) confirms the trend with largest markets, like Germany, France and the United Kingdom, pushing the growth and performing over the European average. New European member countries included in this year edition of the above mentioned CSIL study grew consistently over the European average and registered a +6.8% comparing to the previous year. Poland and the Czech Republic are the largest markets of this countries group and performed well in 2015. Market openness increased in 2015 with imports/consumption ratio growing to 35.5% in the year and exports/production ratio growing to 39%, thus gaining one percentage point on the previous year. In 2015 imports of the European countries reached EUR 2,795 million increasing by 6.9% on the previous year. Over 71% of these imports came from countries members of the Europe-30 area. Main importing countries are Germany, France and the UK. Despite the high growth rate of imports, the trade balance remained positive in 2015 (+EUR 319 million). Export performance has been more marked, with +6% in 2015 in comparison to 2014 and total exports of the area reached EUR 3,186 million. Fastest growing destinations have been North America, Latin America (+30% each) followed by Asia and the Middle East (+17% each), while exports to Africa and Russia decreased. About 39% of the European exports originated in Germany and Italy, representing the main manufacturing countries of office furniture. Market openness is higher for Italy where exports account for over 64% of total output (27% for Germany). The increases in both the domestic and export markets drove the production growth by 4.5%. The new European countries (Europe-13) recorded a better performance than the Europe-17 countries, but they account for only 14% of the total production (10% in 2005). Over the last few years, a relevant part of manufacturing investments addressed Eastern Europe. Following the process of EU consolidation, the industrial presence in West and East Europe has seen a progressive integration, with some of the leading players expanding manufacturing activities especially in Poland and the Czech Republic. Some fast increasing Eastern players started to expand towards Western Europe making acquisitions in Germany and Switzerland. In fact, today the third largest player in Europe is Polish owned. Generally speaking, the office furniture distribution shows a high degree of specialization, with direct sales and office furniture specialists accounting for almost 83% on average. Among alternative channels, e-commerce is gaining ground with an increasing number of e-commerce retailers specializing in selling professional furniture. European distribution of office furniture recorded slight changes over the last years. The direct channel accounts for about 32% of the European office furniture sales (decreasing in 2015), while specialist dealers represent 51% of total sales (stable). Non-specialist dealers showed a downward trend, while other channel (especially e-commerce) progressively increased. - In March, Svoboda Group announced the sale of their company FAW (Fun-At-Work) Consultancy to Hali and both Austrian leading companies entered a partnership. - In January the Danish Tvilum announced the construction of a new production plant in Poland to be operational by the end of 2016. - As of 11 December 2015, Bene AG shares are no longer traded on the Vienna Stock Exchange. - In October Belgian TDS Office Design declared bankruptcy. - In August Nowy Styl Group took over the Swiss office furniture manufacturer Sitag. - In June Haworth Switzerland AG took over the product rights of ZKD Büromöbel AG. - In June Scandinavian Business Seating Group (SB Seating) acquired BMA Ergonomics BV. - In June Fritz Hansen acquired the Danish lighting fixtures manufacturer Lightyears. - In February, the British DAMS acquired Morris Contract Furniture. - In January, following an EUR 20 million investment, Steelcase opened a huge production facility in the Czech Republic and one of its German plants (Durlangen) has been phased out. - In January the Pavan family, with long experience in the office furniture business, decided to acquire Castelli and to restart the production activities.